I have a complicated relationship with fish. I want to like it, I really, really want to love it. I want to serve non battered and deep fried fish to my family twice a week just like all of the healthy food guides recommend. I want the benefit of all of those healthy oils in our diets instead of sneaking little bits of cod liver oil into our smoothies. Yes, I do that. Don’t ask, don’t tell is the rule at our place when it comes to smoothies. Whenever I pass the fish department at the grocery store, I gaze longingly at the lovely snapper, salmon, trout, and shellfish, wishing that I could bring them home and create delicious meals that everyone will enjoy. The problem however is that preparing fish has almost always been an exercise in futility because by and large “ok” was as good a response as I could get, and I often agreed. When the cook says a meal is only so-so, it’s really not great. My mom grew up on the east coast, so you’d think that fish would be a natural extension in our daily meals. Not so. She often explained that after eating fish three times a day for years and years she had no desire to do the same forever more. She did have a few great recipes that graced the table. The first was called fish and brewis and it consisted for the most part of cod fish that had been dried and salted, then rehydrated for cooking, a hard bread that was softened, and fried pork belly. All ingredients meant to store in a pantry for extended periods of time. My mom would make this and the batches were never seemingly big enough, everyone devoured it. My sister would eat multiple plates and as an adult take home the left overs. It was, for whatever reason, a family favorite despite the fact that I hated it and never understood the draw. I still say it’s a great recipe because it was a big hit with everyone else, so I’m chalking it up to a personal preference. The second fish was also dried, these little things called caplin. My grandmother once told me that the caplin would come to shore in schools and they would collect them washed up on the beach and throw them into barrels where they would be salted and dried. You can see a video about them here. I loved them for the longest time, and considered them to be a great treat. In fact, I remember feeling very grown up having tea and caplin with my grandmother when she came to visit. It’s been years and years since I’ve even seen a caplin and I’m not even certain I remember how to eat one. The third fish was hands down, my favorite. Kippers. My mom would wrap them in foil and heat them in the oven, serving them with a bit of bread and some water. 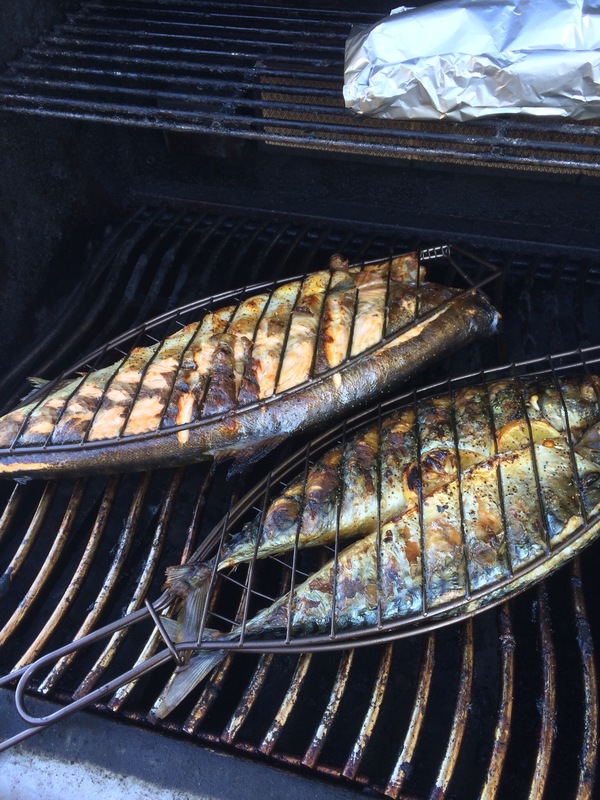 Kippers are salted, smoked herring and just writing about them makes me crave them. I can easily buy these from my local grocery store, frozen and packed in Scotland but I dare not. The sodium content would likely puff me up like a ballon and it would take days to get the smell out of the house. C) Because we are inland it’s actually quite expensive and not worth the risk for a meal that will only turn out mediocre. I’d kind of given up on the whole thing secretly thinking maybe, just maybe, I didn’t actually like fish. Guess what? Not true! A few months ago I had the sudden, unexpected chance to travel to Lisbon, Portugal for a few weeks. It’s a long story for another day, but suffice it to say that I had time to experience the local cuisine. When I go somewhere new, I really like, as much as possible, to eat where the locals eat. Not frou frou overpriced tourist meals, but the solid fare that the average family would eat. 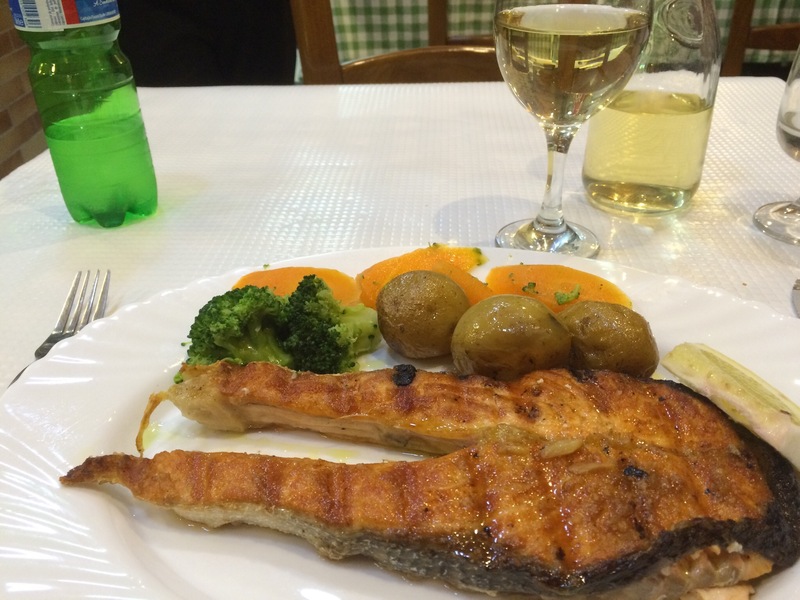 Lisbon was a delight food wise, so many good restaurants serving basic, well prepared meals, their menus filled with fish and more fish. 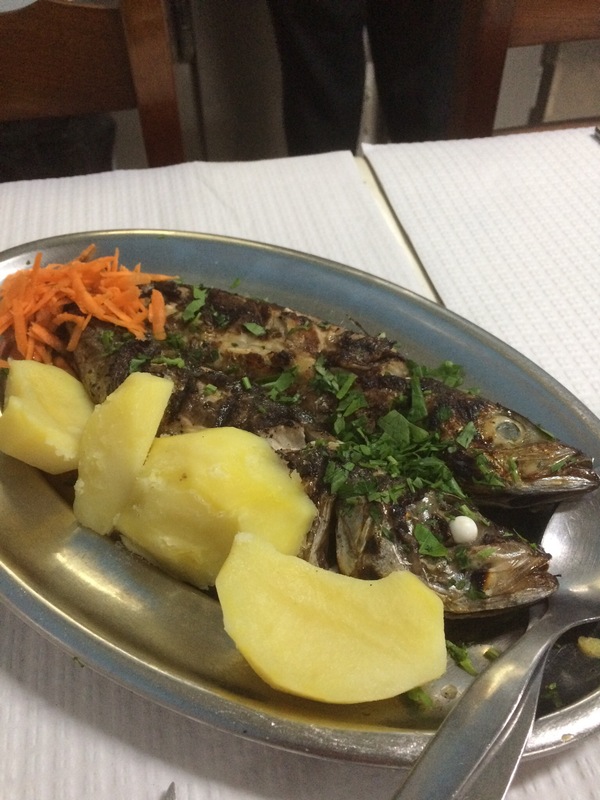 To be fair the grilled chicken was also a three star home run, but it was in Lisbon I decided that I was going to work out whether it was fish or was it me. I started with salmon steaks and worked all the way to whole makerel, served with the head on, watching me trying to figure out how to eat it. I taught myself how to debone along the way. 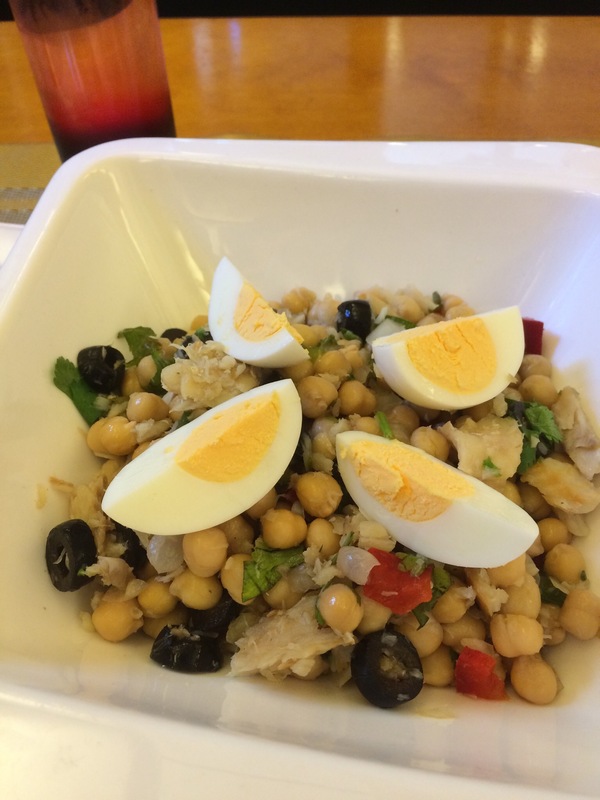 Let me tell you that all of it was delicious except for one chick pea and cod salad made with the dreaded salt cod. Fresh roasted cod was fantastic I learned, the salt cod I can stay away from. Now I know. That matter finally settled, I’d been trying to pluck up my courage to give fish another try. I wanted to make some simple, good fish that I knew I’d like and hope that the family would too. Off to the grocery store I went with a good bet and picked up a whole pacific salmon and two good sized mackerel, two lemons, and two BBQ grill baskets for fish. Go big or go home. They cleaned the makerel for me but left the heads on at my request. The salmon was already cleaned but needed to be de-scaled. That was to be my new skill for the day and I finally learned how to use my fish knife! 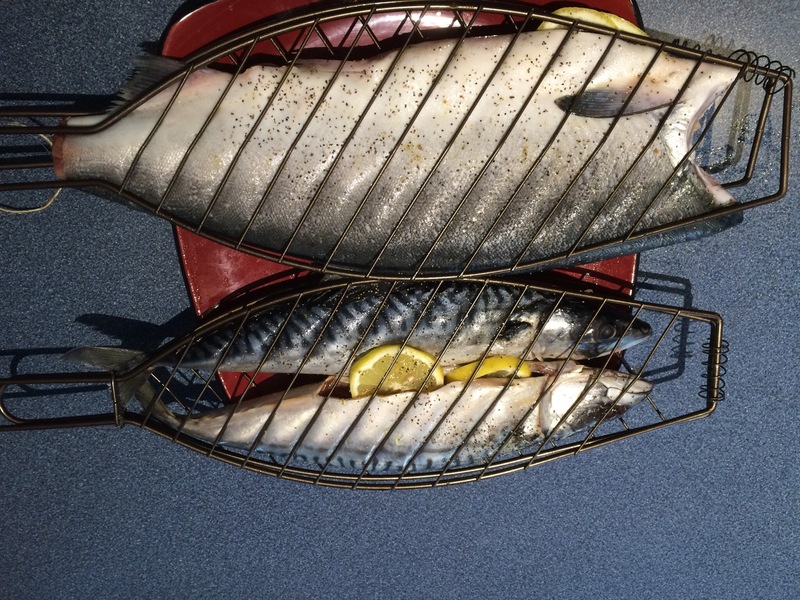 After de-scaling the salmon (makerel don’t have scales), I brushed the outsides with olive oil, salt, and pepper and then put basic seasoning and lemon slices on the inside and secured them into the grill baskets. As simple as that. I grilled them on the BBQ, flipping them only once, and then removed the meat from the skin thinking that my family wasn’t yet ready for food with a face. The verdict? I hit the home run of fish meals, my teenaged son who lives on potato chips and late night grilled cheese asked if we can have this on a weekly basis. Seriously. The recipe in case you missed it? Fish, lemons, olive oil, salt, pepper. Maybe a bit of dill or tarragon or whatever is on your spice rack. A BBQ and a grilling basket. 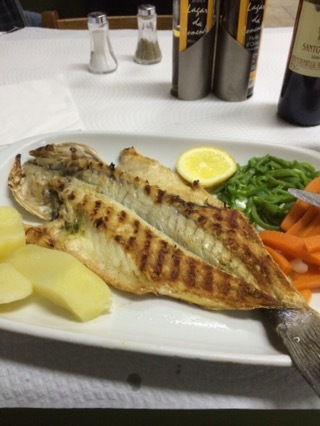 So thank-you Lisbon for your awesome grilled foods and your love affair with seafood. I stopped short of trying your grilled octopus, but perhaps if I ever return we can try again.